Here is a purposeful list of small business marketing actions you should consider taking in 2016 if you actually want to grow that business of yours… in spite of the economic climate. This list will help you navigate the tricky waters of business growth. It feels daunting, when there is so much to know and to face some of these things alone. Which is the very reason I created the Truth & Tonic Small Biz Academy (finally) in fall 2015 and why I share articles like these… continually planting in your beautiful brain that business basics are the most important, and under-estimates, aspects of a successful business. This isn’t a random list. This list is built on the challenges my clients have faced specifically over the past year through elections, political climates and economic conditions that directly and indirectly cause a business slowdown or worry. But it doesn’t have to! Specific best practices in marketing can overcome nearly any environmental issue. I am pretty sure some/most steps in this list are ones you are ready to consider if you want this year to look different than the last few. Audit Your Brand Strength– (“What the heck does that mean, Kim?) Do customers and potential customers truly know what you do compared to the next person in your industry? Are you consistently sharing a clear message about what you offer and why? Get Clear on Your Ideal Customer – Beyond those demographics (where they live, how old they are) your ideal customer has some consistencies you need to lift rocks, survey, explore to discover. It feels ‘safe’ to identify your perfect audience as ‘everybody’ but ‘safe’ doesn’t grow your business. Aligning your business to an audience who is most likely to like you, get what you offer and jump on board is the fastest way to success and fastest way to maximize your time and effort. It takes time to find this ideal customer profile. But when you do, it’s pandoras box of opportunity! Build A Stronger Narrative – People buy into people. If you are not telling your own story as the backdrop to your business, it leaves gaps. It makes us uncomfortable. Your audience is smart. If they sense a hole in your story, they will not trust you as much as you need them to. This narrative can weave into your entire brand, your social sharing experience or it can just be clear on your ‘About Page’ and profiles. But it must exist. You are the ONLY truly guaranteed unique differentiator in your business. Leverage it. Streamline Your Offer(s) – If you are a person who adds and adds and adds and adds layers of content, services and products to your mix of messages and things you have to sell, you may be confusing your audience and diluting your potential of selling your ‘best stuff’. Streamline what you do to the things you do best. The bottom line here is CONSISTENCY my friend. If you are failing at being clear, you are failing at making it easy to buy from you. Sorry… this is the tough truth. But also the easiest thing to fix. Build a Marketing Mix – A what? A mix of marketing methods that make sense to reach your ideal customer. This means, you must do more than simply post links on Facebook, cross your fingers and hope for the best. A healthy marketing mix integrates one message on many platforms. If you business is 100% online, your marketing mix should be many social media platforms + email. If your business is in real life in whole or in part, your marketing mix should include social media, email and in real life marketing methods (a master Marketing Mixology module is is available in the Small Biz Academy). Craving a Social Media Comfort Zone? Click For Your Free Guide! Content, Content, Content – I’ve been asking workshop guests & clients to build a content marketing strategy/ blog strategy for a long time now. Content for SEO and brand building is still a crazy legit way to build social proof, social status, search engine gains and, if you are a little bit savvy with online sales strategies, use your content to directly improve your bottom line short and long term. Build your List! Honestly, nearly every challenge can, in part, be narrowed to the singular fact that your audience isn’t growing. You are constantly trying to sell to the same people over and over again on social media and in your email list (if you even have one). I like Mailchimp – that funky little monkey makes me laugh! 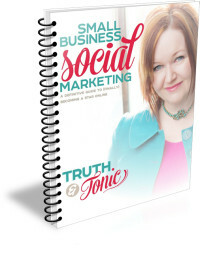 If any of the items are on your “YES, I know I need to do this” list, but you need a program, accountability, support and flow to keep you on track and inspired to do the right things for your business… you will find tools, tips and strategies to rebuild your basics like a marketing pro in the Truth & Tonic Small Biz Academy. If you are ready to grow, rip the bandaid and finally finally finally act like the marketing pro you need to be, then this foundations course (plus hands-on group support and support from me) for savvy, experienced small business owners IS for you (startups will like it too, but it’s designed for those who have lived the pains of trying to grow without marketing chops and have some success – and failures – behind to apply quickly to the lessons). Cheers to you in the next year of your business! This crazy rollercoaster would be way less fun without you riding it with me. And if you’d like to stay up to date on the crazy ride more frequently, join my list and get a free social media guide too!